Neofetch is not available in the repositories. For Linux Mint 18.2 and other Ubuntu-based distributions, you can install the PPA. 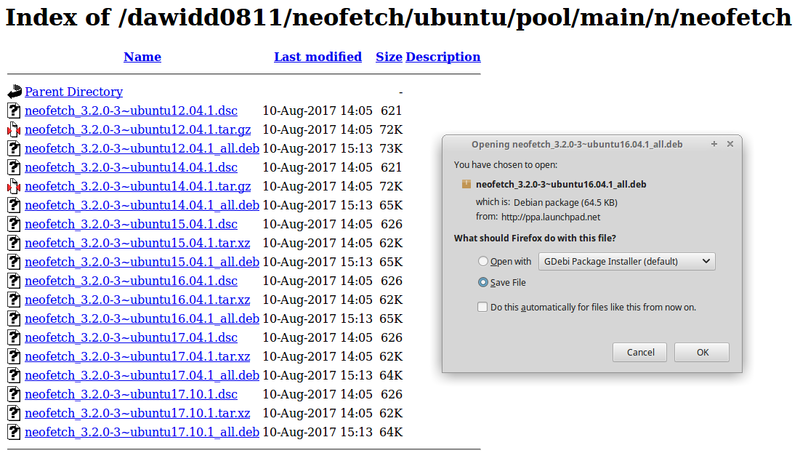 However, I downloaded the .deb package directly from http://ppa.launchpad.net/dawidd0811/neofetch/ubuntu/pool/main/n/neofetch/ to avoid adding yet another PPA to the system. For Linux Mint 18.2 and Xubuntu 16.04.3, the 16.04.1 version was downloaded. It is a 65K file, so the download is quick. Next, install it by double-clicking the .deb file or using dpkg in a terminal. Neofetch installing from Software in Xubuntu 16.04.3. This installation was slower than using dpkg. After neofetch installs, open a terminal and run neofetch. Depending upon the distribution, you should see a different logo. I ran neofetch in two different VirtualBox virtual machines: Xubuntu 16.04.03 and Linux Mint 18.2 XFCE. neofetch in Xubuntu 16.04.3 running in VirtualBox 5.1.26. The Ubuntu logo is shown since Xubuntu is a derivative. 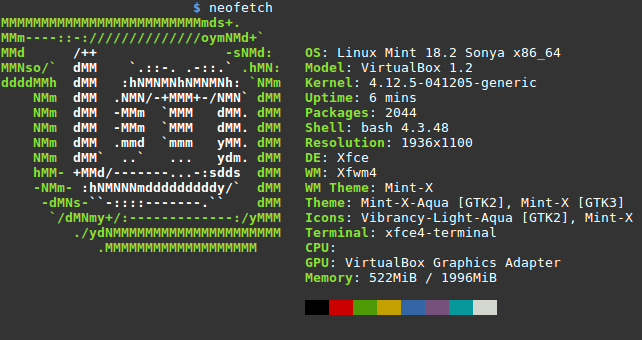 neofetch in Linux Mint 18.2 XFCE running in VirtualBox 5.1.26. Some hardware information will be different because the two virtual machines are configured differently. There are a number of options available for neofetch, so check the man pages for details (man neofetch). You can customize the output. For example, there are various Ubuntu variants, so to display the Xubuntu logo instead of the generic Ubuntu logo, use the –ascii_distro option. For fun, you can pipe the output of neofetch to lolcat, but the result will not be as neatly arranged. neofetch | lolccat in Xubuntu 16.04.3 running VirtualBox. In your home directory, open the hidden file .bashrc in a text editor, such as gedit. At the end of the file, add the line neofetch. ~/.bashrc with neofetch added. Now, each time the user opens a terminal, the distribution logo and system information will appear automatically. This assumes that neofetch is already installed. A more robust script would include a check to see if neofetch is installed as an executable, and, if not, ignore neofetch. In a terminal, enter whereis neofetch to find the absolute path to its binary. We need this path. 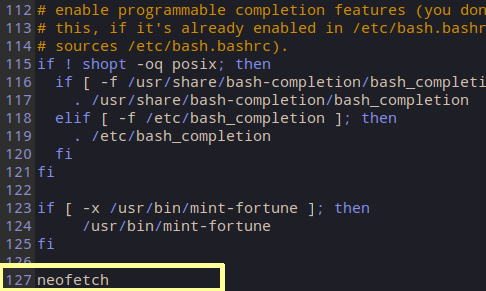 The main executable is usually the first path listed (/usr/bin/neofetch), so let’s use that. If neofetch is installed, then show it when a terminal opens. Otherwise, ignore it. 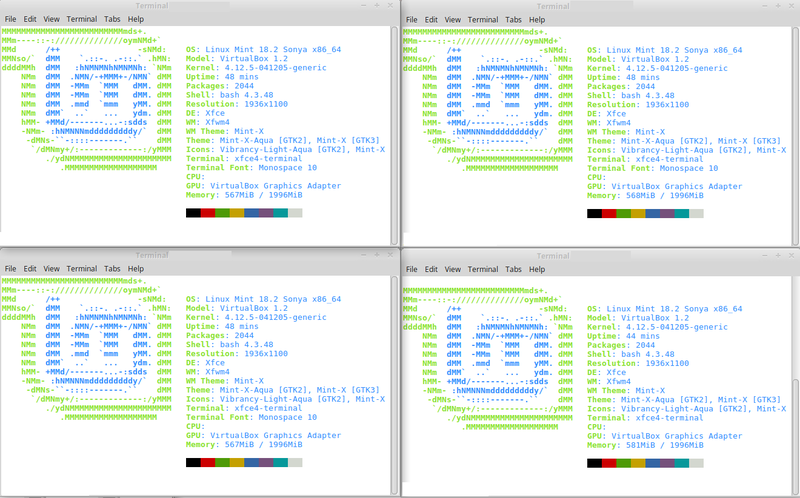 Each new terminal that opens in Linux Mint 18.2 XFCE automatically displays a brief summary of the system information along with the distribution logo in ASCII art. The alternate colors were produced by changing the terminal colors. 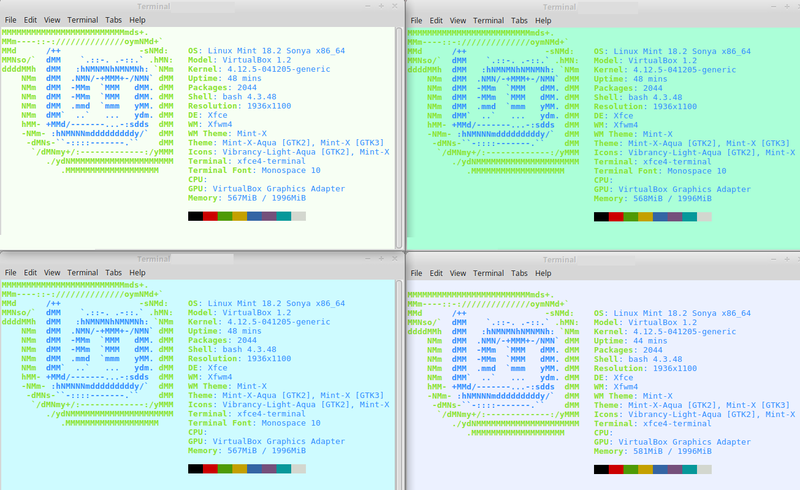 Various terminals in Linux Mint XFCE. Random background colors appear by selecting the “Vary the background color for each tab” checkbox in the terminal color preferences. 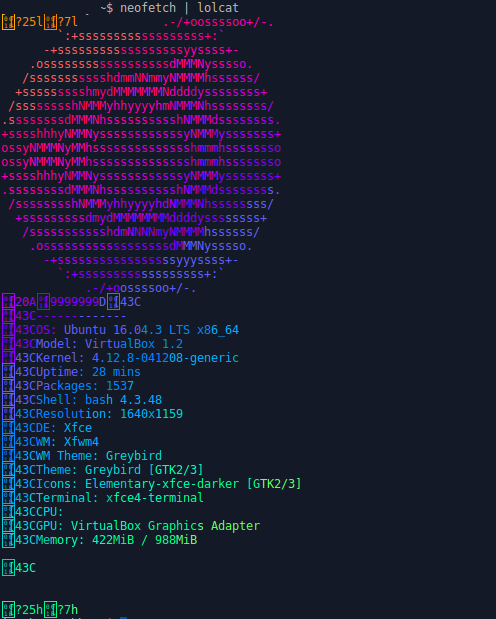 neofetch in Xubuntu with alternate terminal colors and randomized background colors. We edited .bashrc located in the user’s home directory to avoid applying it system-wide. This way, only the user with the edited .bashrc will see the neofetch information. This approach is more user-friendly. Not everyone may want to see a forced neofetch upon opening a terminal. This entry was posted on August 24, 2017, 9:08 PM and is filed under linux. You can follow any responses to this entry through RSS 2.0. You can leave a response, or trackback from your own site.